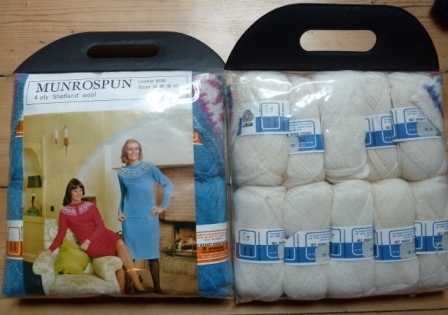 Just this evening, I opened up a project bag to find this very same Munrospun sweater kit. My good friend gave me the bag of unfinished projects that her mother had started years before and asked if I could maybe do something with it. (I think she greatly overestimates my skills.) The sweater appears to be 3/4 complete with front, back and sleeves on stitch holders as well as all the yarn, the fair isle yoke, and even the coordinating tweed fabric pack for a matching skirt. There is, thank goodness, the pattern leaflet as well. The project is a bit before my time and I’m American so I had never seen or heard of the ready-made fair isle yoke kits before and I’m not sure quite how to do it. I think the pattern also calls for a small zipper at the back of the neck – the fair isle yoke has been split, or steeked, up the back. Sadly, my friend’s mother is in late stages of Alzheimer’s and is unable to offer any guidance. I would like to try to finish it and give it back to her in time for her mother to wear this winter. Any advice or lessons learned about grafting the yoke and working with vintage pattern designs would be greatly appreciated. How kind of your friend to think of you and of you to consider making this up for her mother. My kit is still unknitted in the bag, but I have made similar sweaters form scratch so may be able to help. So with my reading of the pattern this is how I’d approach it. Firstly the pattern suggests that the sleeves have to be sewn to the body pieces, like sewing in set in sleeves. I think this is optional and I would come back to this bit once I’d sorted the yoke. To prepare the yoke – I’d remove the cotton which has been knitted into the yoke to expose the ‘live’ stitches at the base of the yoke but above the cast on edge. This cotton has been knitted in, in the same way as for a forethought afterthought heel on a sock. All the stitches would then be picked up onto a long fine circular needle. If you’ve not done this before on a sock there’s a you tube tutorial from Leslie of the Knit Girllls here that maybe helpful. Once the cotton is removed the cast on edge and first few rows below the cotton should come away and can be discarded. Then I’d move to the knitted pieces and using a US3 (my pattern says No.10 which is UK imperial for a modern metric 3.35mm needle) long circular needle – my preference over the 3 needles they recommend to accommodate all the stitches in a circle, I’d knit the 14 centre back stitches, pick up and knit 29 sts around the left back, knit across your 48 sleeve sts, pick up and knit 30 sts from the left front, 21 from the holder, pick up and knit 30sts from the right front, knit across the 48 sts of the second sleeve, pick up and knit 29 sts from the right back and knit across the 15 sts of the centre back knitting the last 2 sts together. Now all the pieces will be joined by that one row of knitting and there will be 263 sts on the needle. Now I’d graft the body stitches to the yoke stitches which are waiting on the other needle. The pattern gives written instructions but if you’re not familiar with this technique, my favourite photo tutorial for grafting/ kitchenering the sts together is from Woolly Wormhead and can be found here, it’s the Kitchener Stitch for Stocking Stitch download at the top of the page. This will not be a quick job and I’d want to set aside some time when I’d not be disturbed as I wouldn’t want to to loose my place when doing this. Now I’m ready to work the neckband, so pick up the stitches on the cotton with US2 needle and knit back and forth in rib. I would then iron the knitting using a damp tea towel between the knitting and iron, to smooth the edges to make it easier to seam the pieces together. Finally I’d sew in the zip, and pat myself on the back! I hope this is helpful? Do keep in touch to let us know how you get on, and if you want to take some pictures of your progress that you’d be willing to share, or to write a guest blog post on you experience, I would love to know how you get on. Wonderful! Thank you for the fantastic instructions. I plan to document the progress and will share the outcome! You’ve no idea how delighted I am to find your page. I was ‘gifted’ a yoke and a few balls of matching yarn almost three years ago but had no idea what to do with it. 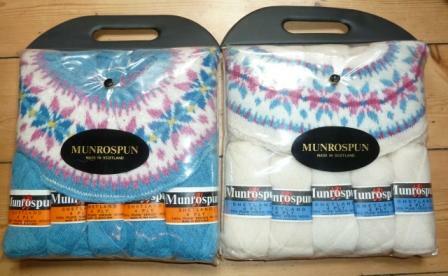 I now assume it is part of one of these Munrospun kits. The yoke is still nicely held in place on the length of cotton and I have taken it out, and held it, and counted the stitches, and scoured the internet so many times hoping for some insight… I have even purchased some 4 ply to match to make up the body. My plan had been to take up the stitches and knit the jumper as a ‘top-down’. I wonder if it would be possible for you to share the actual instructions that are in your kit, perhaps a scanned copy? Hi Ruth, yes, of course, I’ll be in touch. I have also been gifted a third yoke, by the same person. This time just the yoke on it’s cotton and about a ball and 3 part balls of the matching yarn – so I’m doing the same as you and looking for more of the original yarn with a view to actually making this one. Yes, it’s on it’s way. Do let us know how you get on with it.